I’ll never forget the first time my wife read one of my novels. As she was finishing the last few pages, I sat at my computer, pretending to work, butterflies in my stomach. Would she love it or hate it? When she was done reading, she set the manuscript aside and gazed over at the TV set. She seemed lost in thought. She went over to the VCR and picked up the videocassette case for Die Hard, the movie we’d watched the night before. Irrelevant details? What an insult! A long, heated discussion ensued, and I viciously defended each and every word in the book. It ended with me shouting “What the hell do you know?” and storming out of the house, vowing to never let the moron I married read another word of my writing. When she was done, there was so much yellow on the paper it looked like Bruce Willis’ nonexistent dog had taken a leak on it. As a writer, this was one of the most eye-opening processes I’ve ever experienced. 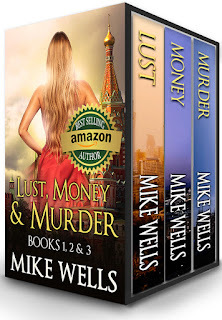 What I learned from it is that if you’re writing plot-driven stories, like I usually write, each and every bit of information you include should have something to do with the story. If it doesn’t, the words needs to be mercilessly cut. 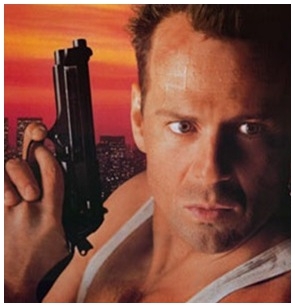 Die Hard is a very good example of how important this principle is. 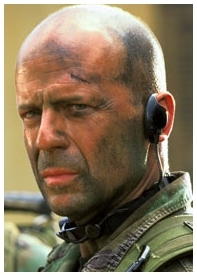 In the movie, do we know if the hero (John McClaine, played by Bruce Willis) has a dog? No, we don’t. What about his home—does he live in a house or an apartment? Again, we don’t know, because there are no scenes set in his home. What about his family? Does he have any aunts or uncles? Again, we don’t know, because that has nothing to do with the story. Now, in contrast, consider The Wizard of Oz. Do we know if Dorothy has a dog? Of course we know this—the dog’s name is Toto. We know it because Toto plays a key role in the story. Among other things, it's Toto that pulls back the curtain to reveal the Great and Powerful Wizard of Oz is nothing a harmless old man hiding behind a bunch of fancy equipment. Does Dorothy live in a house, or an apartment? We know that, too—she lives in a house, which is sucked up into the tornado—this is inciting incident for the entire story! Furthermore, the house lands smack on top of the Wicked Witch of the East and kills her, which is what gets Dorothy in so much trouble in Oz. Finally, does Dorothy have an aunt? We know that, too. Good old Aunty Em. Dorothy misses her terribly when she believes she’ll be stuck in Oz forever and can’t get back to Kansas. The aunt plays a key role in the story. Does Bruce Willis have a dog? In Die Hard, it doesn’t matter. Great post. I'm plot driven also,editor is currently asking me to slow it down, says I don't reveal enough about my Protag's motives and I need to do it through her interaction with friends, minor characters(dogs). I mention them but don't go into detail. Rewrites are making me crazy. Slash and burn is much easier. Of course, I had to do some of that also. Well, I don't know what kind of a writer you are, but you certainly have excellent taste in wives. "When she was done, there was so much yellow on the paper it looked like Bruce Willis’ nonexistent dog had taken a leak on it." Better than rats peeing on it in the warehouse of cyberspace cause nobody wanted to read it! Ha-ha! Great post. I'm the type of writer that feels some things are better left unsaid and left up to the reader's imagination! And just to let you know us wives are awesome!LOL! Have a great day! Oh and by the way I follow you on twitter as myuniquebaskets, throws people a curve everytime! I thought this was brilliant...thank you. I am one of those people that writes too much and then has a hard time editing it down. I appreciate you offering that unique and well-worded bit of insight and advice. And, to echo others, the whole yellow highlighter allusion to dog pee was awesome. I'm now a fan! Brilliant! I’m including this link on my new blog. Not advertising here just wanted you to know. I also downloaded Wild Child and can’t wait to read. We’ve been Twitter friends for a while but somehow I’ve missed your work. I’ll make up for it, promise! Absolutely love how you drove this point home. SuzyIvy tweeted about this on Twitter, and I retweeted. Every writer should read this! If nothing else, it should make us all feel better when we realize we need to cut non-essential characters from our stories. I laughed so hard when I read "the moron I married"
This is a great post! Caught my eye because of the Bruce Willis question (I'm a big fan of the Die Hard movies). I will now probably remember this question every time I write. Although in reality my problem tends to be being too concise. I think it will help as I try to figure out what to include. Wow! This was great! Came across a tweet that sent me here. Was having a lot of trouble with my new WIP. Will also keep this in mind while writing.. Thanks much! Very well said. A very important stage to go through and also one that can be a little painful. Something very similar happened in our house. It was so important to not develop a thick skin but to embrace all feedback as a potential method for improving the story. Cogent post! And a pleasure to read. Thanks! Great post Mike. Very amusing and all too true. My writing is very much plot-driven. Now I don't have to feel guilty about the fact that my readers don't know whether my main character has yellow or green socks on when he's hiding in a dark basement from a crazed serial killer! Thanks for the re-assurance! This was great advice. just wish my husband loved editing lol. Such a great post. I am always being told I have added too much descriptive content, I think we often have so much in our minds that we want to convey we end up underestimating our readers. I am also one of those readers that find less is more. When I am reading I like to create my own picture of characters or scenes in my own mind. If the book is overly described I just skip those parts. In turn if I have to skip parts that leads me to feel like I didn't like the book. Fantastic post, so much insightful. Great! I needed to read this. I had someone read a draft of mine and commented that there wasn't enough description and details, but instinctively I've always felt that too much detail was a bad thing. I was torn between writing more and fluffing the draft a bit, or keeping strictly to the relevant points. Hopefully I'll be able to balance staying on point while not being too dry. Mike: Great sight. What year did you start it? Thanks, Roy. That was back in 1997 or so. Thanks for the comment, Shanaya, it's nice to know the post was helpful. Good luck with your writing! Mike. Thank you - that's a top, top piece of writing advice!